New research from the Max Planck Institute shows that the rhythm of segmentation is influenced by a Doppler effect that arises from gene expression waves occurring in a shortening embryonic tissue. Many animals exhibit segmental patterns that manifest themselves during development. One classical example is the sequential and rhythmic formation the segmental precursors of the backbone, a process that has been linked to the ticking of an oscillator in the embryo – the “segmentation clock”. Until now, this patterning process was thought to be determined simply by the time scale of genetic oscillations that periodically trigger new segment formation. However, Max Planck researchers suggest a more nuanced control over the timing of segmentation. Their findings show that the rhythm of segmentation is influenced by a Doppler effect that arises from gene expression waves occurring in a shortening embryonic tissue. They paint a potentially revolutionary picture of the process of developmental segmentation, one controlled by not only the time scale of genetic oscillations, but also by changes in oscillation profile and tissue shortening. What do you, I and many other animals have in common? Perhaps it isn’t the first thing you think of, but we, like them, have a distinctly segmented body axis. During our development, spatial and temporal cues are integrated to form a specific number of embryonic segments that later on give rise to corresponding ribs and vertebrae. The rhythm of this patterning process is crucial to determine the correct number and size of segments, but how is its timing actually controlled? In vertebrates, the onset and arrest gene expression waves is thought to be controlled by a complex genetic network – the so-called “segmentation clock”. Each arrested waves triggers the formation of a new segment. The underling mechanism was thought to operate like a conventional clock that ticks with a precise period: one tick of the clock equals one new segment. To examine this hypothesis a team of biologists and physicists guided by Andy Oates and Frank Jülicher from the Max Planck Institute of Molecular Cell Biology and Genetics together with colleagues from the Max Planck Institute for the Physics of Complex Systems in Dresden developed a novel transgenic zebrafish line (named Looping) and a multidimensional time-lapse microscope that enabled them to visualize and quantify gene expression waves and segment formation at the same time. To their surprise they found that the onset and arrest of waves happened with a different frequency, indicating that the timing of segmentation cannot be explained by a conventional clock alone. The team worked out that this puzzling difference in frequency was caused by a scenario that is similar to the classic Doppler effect. Time-lapse movie showing a zebrafish embryo making its body segments sequentially and rhythmically. Waves of oscillating gene expression are visible in pseudo-color sweeping from the posterior to the anterior through the unsegmented tissue. The anterior end of this unsegmented tissue moves steadily into these on-coming waves, creating a Doppler effect that contributes to the rhythm of segmentation. Imagine an ambulance driving down the street. Did you ever notice how the pitch of the siren changes as it drives past? This is the Doppler effect, and is caused by changes in the frequency of the sound waves as the source comes towards an observer (you) and then drives away. The same thing would happen if you rapidly approached and then passed a stationary sound source. It turns out that sound waves are not entirely unlike the gene expression waves in zebrafish. These gene expression waves travel from the posterior towards the anterior of the animal (from the tip of the tail towards the head). As they do, the embryo develops, changing its shape, and the tissue in which the waves travel shortens. This leads to a relative motion of the anterior end of the tissue where the new segments form (the observer) towards the posterior (the source). 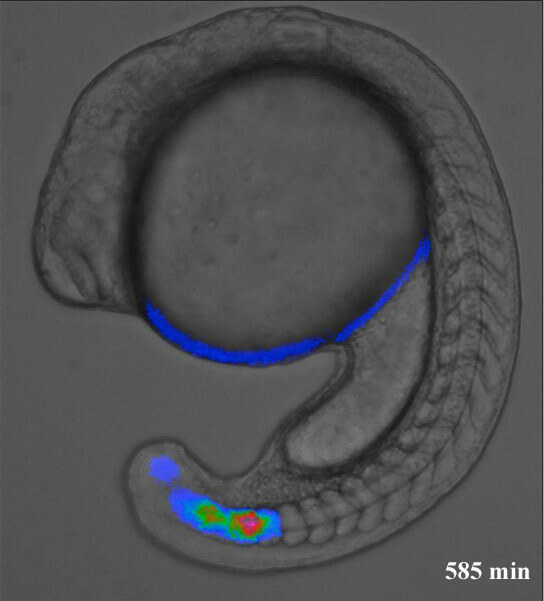 This motion of the observer into traveling gene expression waves leads to a Doppler effect in the developing zebrafish embryo. Moreover, this Doppler effect is modulated by a more subtle effect that is caused by a continuously changing wave profile. This Dynamic Wavelength effect and the Doppler effect have an opposing influence on the timing of segmentation, but the effect of the Doppler is stronger. Since this timing, as mentioned above, determines the number and size of the body segments, it affects the number and size of the developing ribs and vertebrae. The team’s findings could potentially revolutionize our understanding of timing during development. The biological mechanism behind the change in the wave profile is still unclear, but it highlights the complex nature of development and the need to go beyond steady state and scaling descriptions of embryonic development. Be the first to comment on "Researchers Reveal That a Doppler Effect Influences Segmentation"